immediately once you enter the park and head to your campsite. 6pm-Arrive at campsite and set up camp. These three National Wildlife Reserves were helped put up with the help of the Adamson family who were very famous conservationists with funds collected from sales of books and the movie ”Born Free”. The game reserves are world famous because of the rare species of wildlife only found in this region and no where else. This includes: The Reticulated giraffe, The Beisa Oryx, The Blue Necked Somali ostrich, The Grevy Zebra and the Gerenuk or better known as the Giraffe antelope among other many species of mammals and birds. Early morning game drive to be followed by breakfast. 10.30am-Optional visit to a Samburu Village. After breakfast leave for lake Nakuru National Park with lunch en route and stopping at the Equator to see a demonstration of the rotation of water at north and south of the equator. Lake Nakuru park is situated at the floor of the great rift valley and is world famous as an ornithological paradise where often about 2 million flamingos gather around the lake. It also acts as a sanctuary for endangered Black and White Rhino. Also the Rothschild Giraffe which is under the threat of extinction can be found here including 4 of the big five amongst other species of wildlife. Lake Nakuru was named a Ramsar site in 1990, making the park a wetlands of international importance. 6pm-Set up camp to be followed by dinner at 8pm. After breakfast leave for lake Naivasha. Arrive in good time to set up camp at Crayfish camp. 3.30pm-Your first opportunity to go for a walking safari. After breakfast leave for Maasai Mara to arrive in time for lunch and setting up camp. 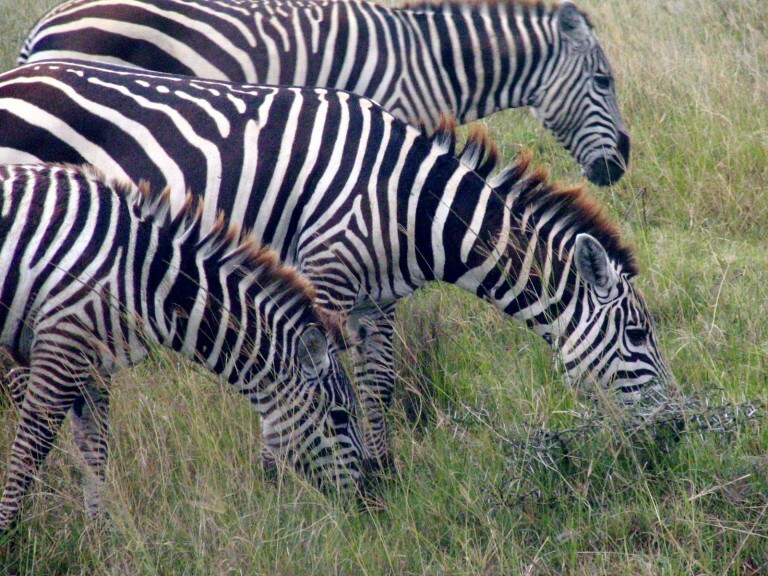 Maasai Mara is world famous because of the annual migration of the wildebeest where approximately 1.5 million wildebeest and zebra take part in this breath-taking phenomenon. It was recently declared one of the seven wonders of the world. The big five can be found here, including many species of antelope, zebra, giraffe and many other species of mammals and birdlife. After breakfast leave with picnic lunch for a full day game drive. 8pm-Dinner followed by coffee at the campfire. After breakfast gamedrive en route out of the park to Nairobi. Advise driver of the location you need to be dropped off at. c) Transportation in an open rooftop tour van. e) Extra activities like visit to villages, balloon safaris, shopping etc. 5) Drinks both soft and alcoholic. 2) Extra activities like visit to villages, balloon safaris etc.